James Walsh was a Royal Navy Medical Officer from 1968 to 1973. He was a GP serving Rustington and Littlehampton from 1973 to 2013. He was a Royal Naval Reserve from 1973 to 1993, retiring as Director Medical Reserves as Surgeon Captain. He has been a member of Arun District Council and Littlehampton Town Council since 1975. He is a past Chairman of Arun District Council and has been Town Mayor twice. 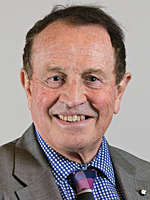 He has been a member of West Sussex County Council since 1985 and is a past Chairman Social Services and Deputy Leader. James was a full Member of the EU Committee of the Regions for SE England from 1998 to 2002. He is a past Member and Chair of the Sussex Police Authority and a member and past Chair of Littlehampton Harbour Board. He is a past Commander in charge St John Ambulance, Sussex and is currently Chairman. He is a former Director and Chair of the Arundel Festival. James is a lay reader and Special Minister Arundel Cathedral. He was knighted by HM the Queen in Order of St Johns October 2012.